← The 2nd Annual Breast Cancer Show Ever! Breast Cancer Charity Event! Celtic Woman, a smash hit around the globe, returns with their newest live show! The awe- inspiring vocalists and mesmerizing Celtic violinist continue to capture the hearts of fans across the country with what critics are calling an “uplifting” and “beyond captivating” concert experience. Their Emmy-nominated television special, Celtic Woman “Songs from the Heart”, filmed live from Powerscourt House and Gardens in Ireland, is a blockbuster on PBS. In just five short years, this unique all-female ensemble continues to have mainstream success without the aid of traditional sales drivers such as radio or video airplay. No other group of this particular adult contemporary genre can claim over 6 million CDs/DVDs sold worldwide, two Top 10 album debuts on the Billboard Top 200, 3 Gold and Platinum albums, 4 Top 5 releases on the Billboard Top Video chart and over 1.2 million concert tickets sold. They have succeeded by connecting directly to fans via their Public Television specials, their frequent touring and then having those fans share the experience with friends and loved ones. Come see Celtic Woman with their 6 piece band and the Aontas Choir perform unique renditions of Irish standards, classical favorites and contemporary hits. 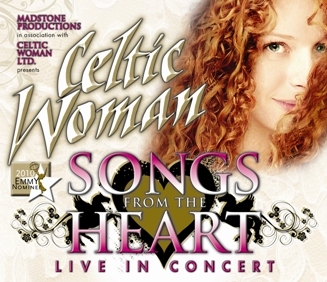 Celtic Woman “Songs from the Heart” promises to be a live concert event that you and your entire family will never forget. This entry was posted in akron, Art News, arts, classical, music, ohio, shows, theatre and tagged akron, art news, celtic woman, civic, concert, live, show, theater, theatre. Bookmark the permalink.